TO do so, simply tap on your Settings app to launch it, and then tap on the Privacy icon. The very top option is Location Services. Tap on it, and you can toggle all location-based services OFF at the top. You can also disallow access to your locations for any of the apps listed below that, toggling each one to OFF. Swipe to the bottom of the list and you’ll see an area labeled System Services. Tap that and then look to the end of the list. Select Frequent Locations. It’s here that you can turn this feature OFF with a quick toggle to the Frequent Locations button. 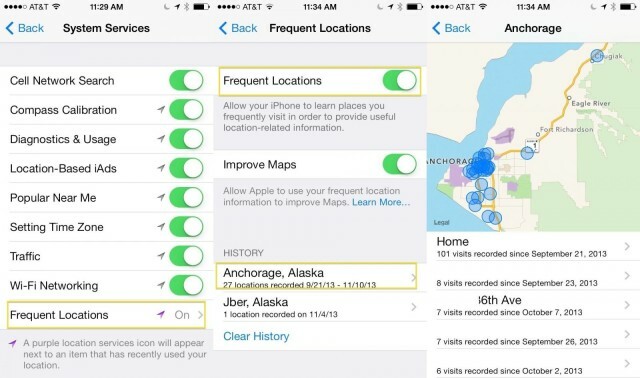 You can also allow Apple to use your frequent location info to improve the Maps app, or turn that OFF as well. Near the bottom, you’ll see a place to tap that groups your locations into areas. Tap on a specific region and you’ll get a map with all the places your iPhone has recorded a location. It’s pretty handy to see what kind of info your iPhone carries around with it, and it’s also nice to be able to turn it off, to varying degrees.